Many brides to be find the initial thought of shopping for their dream gown extremely daunting. We know it can seem like a huge task and one that takes you out of your comfort zone, we however are very used to it and it is our job to put you at ease. Don’t ever be afraid to ask questions, we don’t laugh or judge we are here to help and guide you every step of the way. For your convenience we have compiled a list of our most common queries, but if you still have questions please just ask and we will be happy to help. In all honesty it depends on when you are ready. Some brides are super organized and want the dress to be the first decision made as they feel it contributes largely to the overall look of the day. Others are more relaxed and leave the dress search until later on the the planning. either way we recommend at least a 6 month timescale for delivery of a gown and then around 8 weeks for alterations and fittings. Our most common lead time is around 12 -18 months. When you first arrive for your appointment one of our consultants will take some basic details from you and we will have a discussion about the general ideas you have for your wedding day look including your venue, type of service, colour scheme if you have chosen one any special things planned but most importantly how you imagine looking on your wedding day. 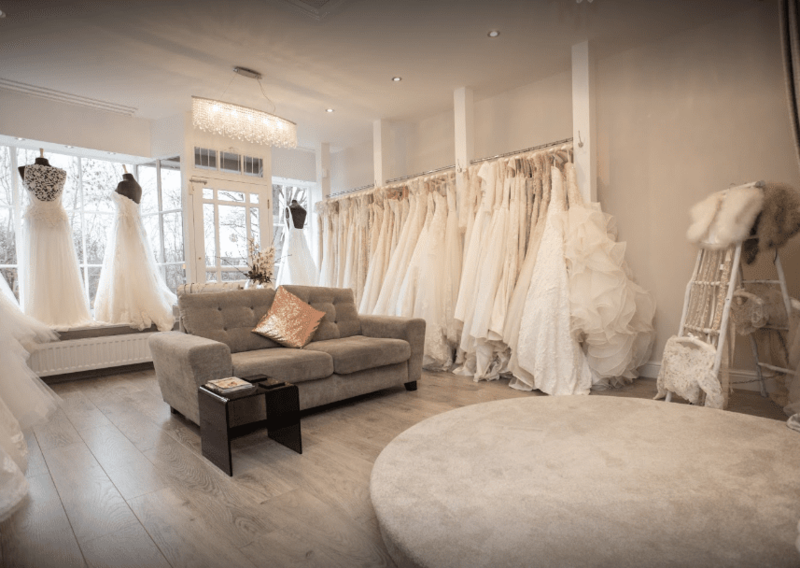 We will then talk you through our collection of gowns and give you a brief background into our designers before allowing you some time on your own to browse the collections and decide on the gowns you wish to try on. Once you have done this we will highlight any gowns that we think you may wish to add to the list, we seat your guests and provide refreshments for all and then…….we dress up! As we go through your appointment we can discard any styles we dismiss and add new styles to try if we feel we have missed any. We will also assist you in pairing your accessories and explaining how you can alter your look with different combinations, we can even discuss hair styles and make up looks! At the end of the appointment if you have found your perfect gown we can place an order (see “how do I purchase my wedding gown” below) or if you prefer we can give you the details of your shortlisted gowns and book a second appointment for you to return and try your favorites again on a new day. The choice is yours, there are no pressure sales techniques or panic buying strategy. We want you to be 100% happy and confident with your choice. Generally we have everything you will need for your appointment however you may wish to ensure you are wearing comfortable underwear and a strapless bra is always useful. you may bring you own shoes if you have a heel height you wish to try on with the gowns although a full range of bridal shoes is available for your use during appointments should you require them. Generally our gowns range from £1000 to £2600 however there may be some small variations to this range both above and below as new collections arrive in the boutique. It is always recommended to advise us of your budget at the start of your appointment so we can assist you to choose suitable options. Do you provide a fittings service? We understand that this special experience is one you wish to share with your family and close friends and we really do welcome that, however we do request for a number of reasons that you try to limit your guests to around 2 -3 We offer appointments in Two separate areas. The First is our main Boutique. On the main shop floor a spacious area and fitting room are available for the bride and up to 3 guests. This is our most spacious appointment space but we do not enforce a locked door policy so we may occasionally get visitors to the shop that you will be visible to. The second is our Private Consultation Suite, an area to the rear of the boutique that is smaller than the main shop floor but totally enclosed so it is very private. Our Private Consultation suite can accommodate the bride and up to 2 guests. Our sample gowns are between a UK 8 and a UK 16. Please do bear in mind we only have each dress in one size, however with some designers it is possible to order a sample closer to your size to try (separate cost incurred) Many of our gowns are corseted at the back so a size 18 could still try on a size 14 gown and have idea of the final look. equally a size 8 bride can be pinned into a UK 14 gown to see the end look. How do I purchase my wedding gown? Once you have decided on the gown we will take your measurements and you will be required to sign a copy of our terms and conditions which we will discuss with you to advise on all key points. You will then pay a 50% deposit to secure your order and enable us to place your gown on order with the designer. We will then arrange for your dress to be delivered into the boutique approximately 12-14 weeks prior to your wedding date, at which point we will contact you to book in your first fitting. Is my wedding gown insured? You can buy from us with confidence! As the Harrogate Wedding Lounge is a fully accredited member of the British Bridal Retail Association (BBRA) all of our brides receive complementary gown insurance and discounted wedding insurance. Details of how to activate the free and additional cover will be given to you on receipt of your deposit.